Kingsborough play on Saturday, July 8, at HopMonk Tavern, 230 Petaluma Ave., Sebastopol. 8pm. $15. 707.829.7300. 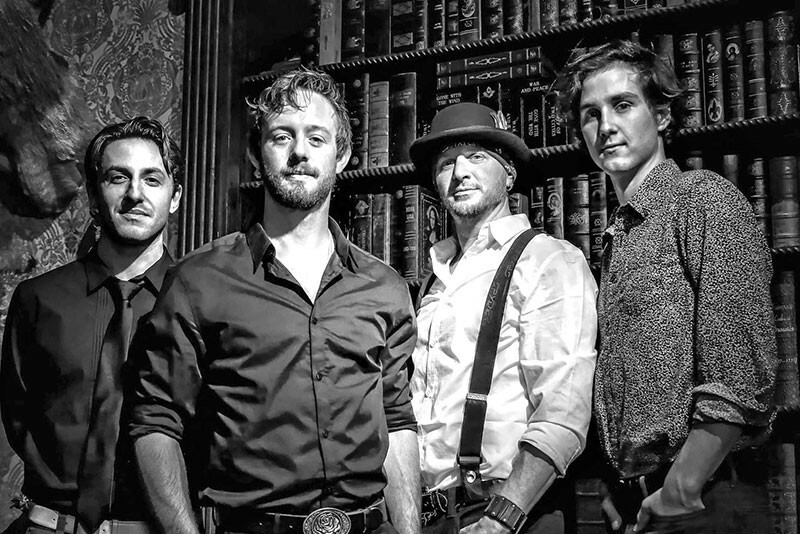 WORKING CLASS HEROES Billy Kingsborough (second from left) and his band draw on classic blues-rock for new album. Guitarist and songwriter Billy Kingsborough was back home from college and looking to jam in 2010. A friend introduced him to guitarist Alec Leach, and "the next thing you know," says Kingsborough, "we played our first open mic, and it was just easy, it just worked." 1544, and they're giving fans a first listen with an album-release concert on July 8 at HopMonk Tavern in Sebastopol, where that first open mic took place. "The first conversation we had was a lot about old blues stuff," Leach says. Sharing an affinity for players like B. B. King, Eric Clapton and Duane Allman, Kingsborough and Leach established the group as a straightforward rock and roll band with roots in the blues, anchored by fuzzy guitars and hook-heavy grooves. Backed by a thumping rhythm section made up of bassist Chris Mangione and drummer John Whitney, the band's classic riffs and searing solos are matched by an infectious live energy that's made them a popular party band. "We try to project the truest form of rock and roll that we know," says Leach. "We feel that we have this mission to convince people that having a damn good time is what this is all about," adds Kingsborough. "That's how we view rock and roll, and that's what we want to instill on the people that come to our shows." That musical exuberance is paired with a working-class-band mentality and discipline aided by the fact that the band mates are also all roommates. The new album's title, 1544, is a reference to the house number of the ranch property where the four members have lived the past two years. The band turned a barn on the compound into their practice space and collaboratively composed the entirety of 1544 since coming together. Yet Kingsborough says the album really came to life once they stepped into the Laughing Tiger Studio in San Rafael to record last year. The group took advantage of the studio's isolated and expansive tracking room to give the album a massive atmospheric presence. Kingsborough notes that the band was given time to explore sonic textures in a way they hadn't done before, leading to layered guitar tones and dynamic distortion and reverb effects that help the album stay fresh and compelling throughout. "The album is a way to let loose," Kingsborough says. "That's what music is to us."